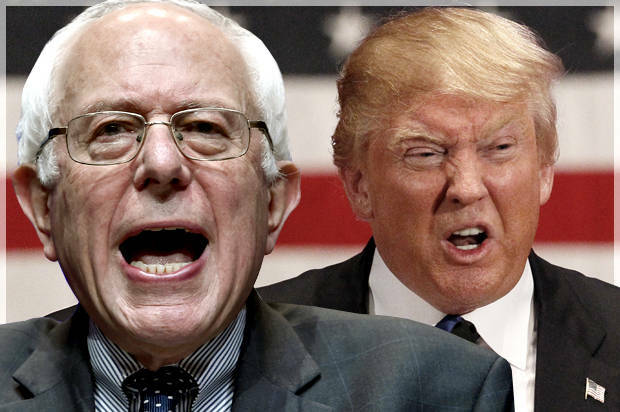 Accountable Talk: Who Said it Best: Berners or Trumpeters? Pop Quiz: Who is more likely to say each phrase, a Berner or a Trumpeter? 1. Hillary's crooked! 2. Hillary's a criminal! 3. The primaries were rigged! 4. The FBI doesn't understand the law! 5. That was an ad hominem/ad populum/strawman! (while exhibiting little understanding of any of those phrases) 6. We live in an oligarchy! 7. It's because she's a woman! 8. If only people understood my candidate more, they'd vote for him! 9. Hillary only won because of low information voters (i.e., minorities)! 10. I'd rather see this country go down in flames than vote for her! 11. My candidate doesn't take money from PACs, so he is pure and can say what he really thinks! 12. Sure, my candidate has no specifics on how to implement his ideas, but at least he has ideas! 13. This is a political revolution! 14. I don't know a single person who supports Hillary. That proves she cheated! 15. The polls are obviously rigged, because they don't show my candidate winning! If you answered that most of the quotes are from Bernie supporters, you are a Trump supporter. If you answered that most of the quotes are from Trump supporters, you are a Bernie supporter. If you have spittle running down your face because of your rage, you may be either. If you are smiling quietly because all of these attempts from the right and the left have failed miserably and Hillary has a clear path to the presidency, you are a Hillary supporter.